Thanksgiving week 2018 is upon us, kicking off the holiday season that will last for the next several weeks. With all of the meal plans being made for the big Thursday, most cooks will have a lot on their plates, literally and figuratively. One of the mainstays of the traditional Thanksgiving meal is the all-American apple pie. And to be sure, they are delicious. But they can be time consuming. 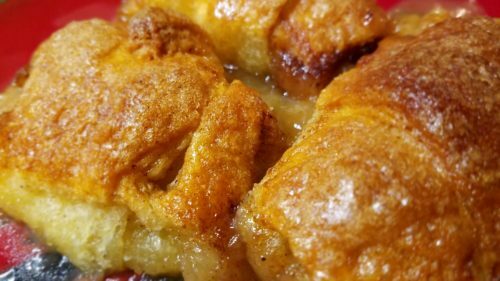 If you’re pressed to get everything prepared this Thanksgiving, try making these Quick and Easy Apple Dumplings. With just a few ingredients, including Mello Yello, and a little preparation, you can put together an apple dessert that is almost as good as apple pie, but twice as easy. When making any dish with apples, choosing the right variety is critical in getting the right consistency in your finished product. With these Easy Apple Dumplings, you can go two directions. If you want the apple filling to be softer, use a Fuji or a Granny Smith. For a firmer dumpling, try a Jonagold or Winesap. Wash and peel the apples. Core both apples and cut into eight equal pieces. The handy-dandy apple slicers available in the gadget section of most grocery stores makes this step even easier. Melt the butter over low heat in a small saucepan. When the butter is melted, add the light brown sugar, vanilla, cinnamon, and nutmeg. Whisk until fully blended. Allow to cool slightly. As the butter is melting, lightly coat the bottom of a 9”x13” baking dish with cooking spray. Unroll the crescent roll dough. Into each triangle of dough, place on apple piece. Roll the apple piece into the dough. Tuck any loose dough around the apple, then place into the baking dish. Space the dumplings evenly, leaving a little room between. Pour the slightly cooled sauce over the dumplings. Be sure to coat each dumpling fully. Carefully pour the Mello Yello around the edges of the pan and between the dumplings. Avoid pouring it directly onto the dumplings. Bake the Easy Apple Dumplings for around 45 minutes. Start checking for a golden brown finish at the 40 minute mark. After removing the dumplings from the oven, allow them to cool for 10 minutes before serving. Try including a scoop of vanilla ice cream on the side.